Before moving into her country-cottage home, Kris Aquino lived in One Roxas Triangle, an exclusive high-rise residential building in Makati. In this building, the Queen of All Media shared two adjacent units with her sons Josh and Bimby. The 330sqm unit registered in the name of Josh is named Laguna since it faces Laguna de Bay. The 308sqm unit in Bimby's name is called Forbes because there is a view of nearby Forbes Park. 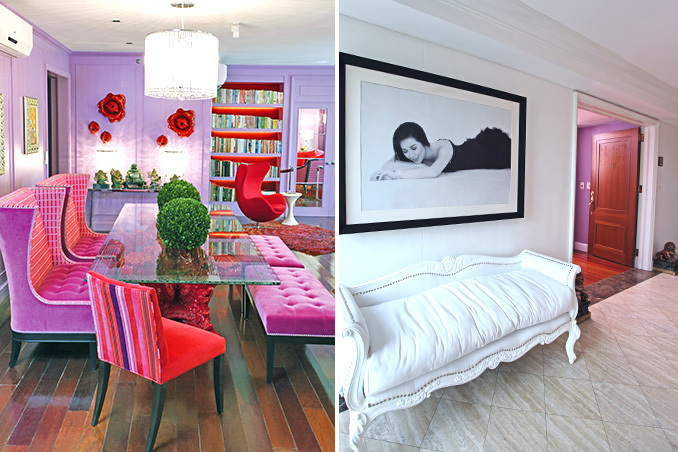 Both units were designed by famed interior designers Cynthia and Ivy Almario and are filled with bright colors, bold patterns, and oversized furniture pieces. Original article by Gabby Reyes Libarios. Photographed by Rene Mejia (House) and Mark Nicdao (Portrait). Shoot production by Anna Pingol. Makeup by Juan Sarte. Hair by Jonathan Velasco. Fashion styling by Liz Uy. Read the original article in the YES! Celebrity Homes Special 2012. To download a digital copy of YES! Magazine, visit Summit Newsstand at http://summitnewsstand.com.ph/yes-magazine.